Alignment 5 requires a new bridge to cross a small creek to the east of Alamo Pintado Creek, landing on an unpaved portion of Coyote Creek Rd. A Class I shared-use path would run along the west side of that road in an existing trail easement, north to Coyote Creek Rd. Splitrail fence would border the shared-use path to provide safety from the edge of the road and to create an additional buffer for neighboring properties. At Coyote Creek Rd the alignment would enter the roadway and cross Alamo Pintado Creek on the existing vehicular bridge. After crossing the bridge the alignment would run parallel to the road on the north side in a new easement, before reaching the park where two new shared-use paths would border the eastern and southern perimeters of Sunny Fields Park. Alignment 3 requires a new bridge to cross Alamo Pintado Creek towards the Creekside residential community. East of Rebild Dr the alignment turns north on public land. A Class I shared-use path would continue on the west side of Alamo Pintado Creek to Coyote Creek Rd. The northern-most portion of this section may require slope stabilization and reinforcement between the creek and the shared-use path. Split-rail fence would border the shared-use path to provide safety from the edge of the creek and to create an additional buffer for neighboring properties. At Coyote Creek Rd the alignment would run parallel to the road on the north side in a new easement, before reaching the park where two new shared-use paths would border the eastern and southern perimeters of Sunny Fields Park. Solvang will move forward with the No. 5 alignment option for the proposed Sunny Fields Bike Spur, city councilors decided at their meeting Monday night. 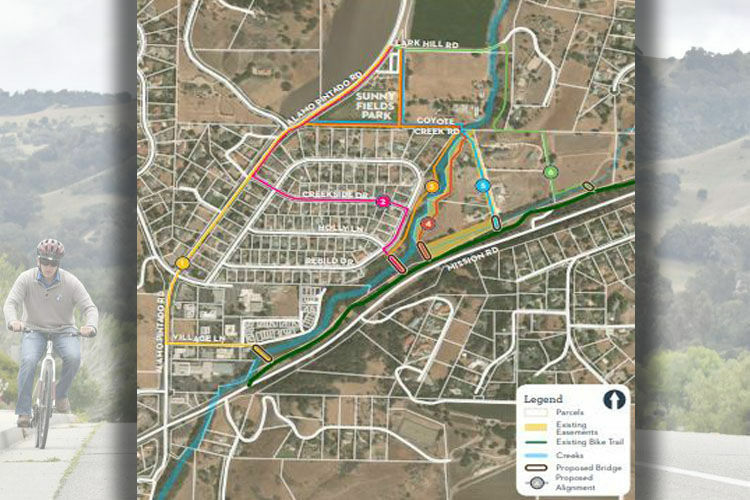 The board nixed a hybrid option proposed by city staff that combines alignments 3 and 5, while also eliminating the northern portion of alignment 3 along Alamo Pintado Creek. The proposed alignment 3 path would follow Alamo Pintado Creek north to Coyote Creek Road and then parallel the road on the north side. The option also calls for a new bridge to cross Alamo Pintado Creek. Alignment 5, which would run farther east, also calls for a new bridge, one which would cross a small creek east of Alamo Pintado Creek and land on an unpaved portion of Coyote Creek Road. 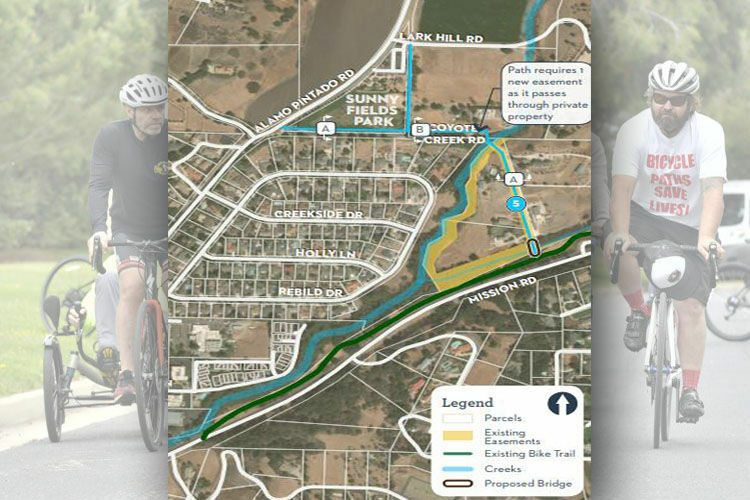 The bike path would then run north along an existing trail easement to Coyote Creek Road and would enter the road to cross Alamo Pintado Creek on the existing bridge. This technical draft from Alta Planning and Design shows the different 'alignment alternatives', the associated cost and some of the construction difficulties with six options for the Solvang City Council to choose from to complete the Sunny Fields Bike Spur project . Public Works Director Matt van der Linden recommended the 3a-5 alignment at Monday’s meeting, which he said would cost nearly $3.3 million. The price is more than the cost of alignment 5, but $1.2 million less than the original cost of alignment 3. Alignment 5 has a nearly $2 million price tag. Initially, council member Karen Waite wanted to table the discussion, but councilor Ryan Toussaint made a substitute motion to move forward with alignment 5 by itself. “We have a deadline, so tabling it I don’t know is really an option at this point,” Toussaint said to Waite. Waite said she wanted to table talks because “quite frankly I wasn’t prepared for the vehement rejection of these plans." “I really would like to see this done. Maybe we haven’t looked at all options yet,” Waite said. Toussaint’s substitute motion passed unanimously with Mayor Jim Richardson and Councilwoman Joan Jamieson recusing themselves. Many Creekside residents spoke at Monday’s meeting, expressing their disapproval of the 3a portion. Melissa Nathan was one of them. “The proposed 3a million-dollar bridge to nowhere is not being billed for what it truly is. It is not a small path for a few children to pedal to school on,” Nathan said. She said Alta’s study doesn’t adequately delve into the impacts the project will have. “The proposed Holly bridge will dissect and fragment this sensitive area,” Nathan said. Tracy Beard, with the Solvang Chamber of Commerce, said councilors were putting the cart before the horse. Creekside resident Carl Butler said the existing proposal for Holly Lane bridge falls within the floodway and the council should get the Federal Emergency Management Agency’s approval before moving forward. The City of Solvang released this PDF describing the Sunny Field Bike Spur project and outlining some of the possible connections from the existing bike path to the park. “In conclusion, the council might want to have FEMA diminish the floodway footprint if they want to proceed with this proposal,” Butler said. Nancy Emerson said she was concerned about the cost of building the bridge. “It seems to me that we need to try to do it as cost effectively as possible and that we don’t need to have two bridges across the creek and that it would be better to eliminate 3a,” Emerson said. Van der Linden said the city is trying to get grant funding through California’s Active Transportation Program to cover 78 percent of the cost. Planning and design firm Alta prepared the grant application. Submitted projects will be approved by the California Transportation Commission by the beginning of next year.